S&P/Case-Shiller released the monthly Home Price Indices for July (actually a 3 month average of May, June and July). 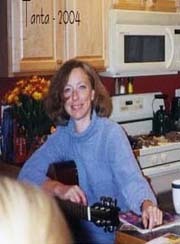 This includes prices for 20 individual cities and and two composite indices (for 10 cities and 20 cities). 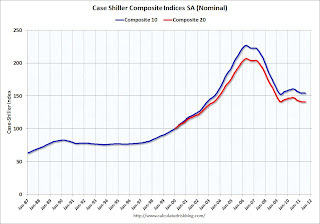 Note: Case-Shiller reports NSA, I use the SA data. The composite indexes were up about 0.9% in July (from June) Not Seasonally Adjusted (NSA), but flat Seasonally Adjusted (SA). 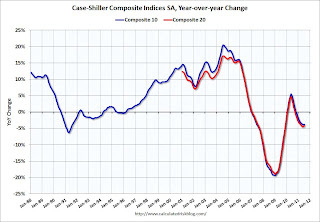 Data through June 2011, released today by S&P Indices for its S&P/Case-Shiller Home Price Indices ... showed a fourth consecutive month of increases for the 10- and 20-City Composites, with both up 0.9% in July over June. Seventeen of the 20 MSAs and both Composites posted positive monthly increases; Las Vegas and Phoenix were down over the month and Denver was unchanged. The Composite 10 index is off 32% from the peak, and down slightly in July (SA). The Composite 10 is 1.4% above the June 2009 post-bubble bottom (Seasonally adjusted). The Composite 20 index is off 31.8% from the peak, and up slightly in July (SA). The Composite 20 is slightly above the March 2011 post-bubble bottom seasonally adjusted. The Composite 10 SA is down 3.8% compared to July 2010. The Composite 20 SA is down 4.2% compared to July 2010. 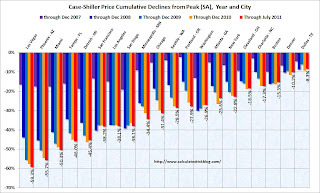 Prices increased (SA) in 8 of the 20 Case-Shiller cities in July seasonally adjusted. Prices in Las Vegas are off 59.2% from the peak, and prices in Dallas only off 9.5% from the peak. As S&P noted, prices increased in 17 of 20 cities not seasonally adjusted (NSA). However seasonally adjusted, prices only increased in 9 cities.